The three states of consciousness during the years 1926-62 were already mentioned in chapter Visions. The description of the ecstatic state needs to be specified, particularly, because it appeared in two forms. It needs to be differentiated between the state of vision and the state of elevated tranquillity. The state mentioned last appeared almost all the time after receiving Holy Communion, occasionally between visions of the Passion also. During this state, she experienced a blissful union with Christ. In contrast to the ecstatic state of visions, she could be addressed during this elevated tranquillity. Either after being asked or out of her own initiative, she could make statements of unusual character about persons, things or events of the contemporary time. Extraordinary was, that the contents of these statements exceeded her knowledge and consciousness in her usual condition of mind. "The person talking to her was 'seen through', sometimes ... without reproach, remarks concerning the former life of the respective person were made, or answers were given to a question before even asked. It was possible to talk about problems concernig the own spiritual welfare or that of others..., sometimes even personal advice was given" (Steiner, Lebensbild Therese Neumann, p.34). Out of this state, Therese returned directly into her usual condition (i.e., in contrast to a vision, the dazed state was omitted). However, Therese could not remember the statements she had made in the state of elevated tranquillity. Exemplary for advice given in elevated tranquillity are the warnings to several persons, prosecuted by the National Socialists. She warned, e.g., Dr. Fritz Gerlich, who opposed the National Socialistic potentates with his paper 'Der gerade Weg' [The straight way]. She told him, not to return to Germany but to stay in Switzerland. He did not follow her advice; soon after his return to Germany he was taken into custody, and after 16 months of internment in Dachau was assassinated. Therese told also Fr. Ingbert Naab OFMCap, that his life was endangered. Without knowing, that a warrent of arrest had been issued already, he followed Therese's advice immediately. 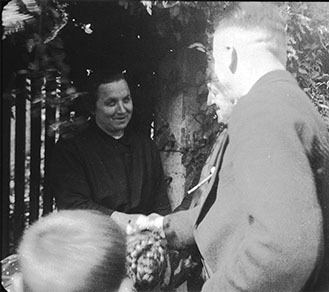 Just before the SA [Nazi Storm Troops] entered his convent, he had fled to Switzerland.